I don't know about you, but over the years I've copied down, cut out or otherwise saved many recipes that I want to make "some day... but not today". Yesterday I had to be home waiting on two deliveries so it was the perfect day to dig out a brand new recipe that I've put off for 'lack of time' or whatever reason. The recipe I tried was an old Martha St*wart recipe and although she can employ professional chef's to make them oh-so-perfect and completely picture perfect, I think the finished cookie on an everyday average housewife level was pretty good too. They take a long time to make so be sure you have a good 2-3 hour window 'free' to embark on these if you decide to make them. I personally got to the point where I was so sick of making them that I got a little sloppy, my lines weren't perfectly straight and I didn't care anymore. At that point I threw away the rest of the batter (which would have made about 2 more cookies) and called out 'Enough!'. Unfortunately for me they were a huge hit with my family, they loved them and they've since declared we have yet another 'must have' during the holidays. Before you start this recipe take a large piece of cardboard or tape two pieces of heavy card stock together. Using an exacto knife cut a rectangle in the center 3 inches by 6 inches. This will be your 'stencil' for the cookies. Preheat oven to 400 degree's while you place the egg whites and sugar in a mixing bowl. Mix on medium until foamy. Mix in flour and salt. Add melted butter, cream and vanilla. Mix. Place 3/4 c batter into each of two bowls. Tint one pink and one red. Transfer the tinted batter to decorator bags with a small round tip or if you don't have them, use a large ziplock baggy with a tiny corner cut off. Lay the cardboard stencil on a silpat mat on a baking sheet or on parchment lined baking sheets. Using heaping tablespoon of dough, spread it in the stencil, smooth and lift the stencil to leave a rectangle cookie dough shape. 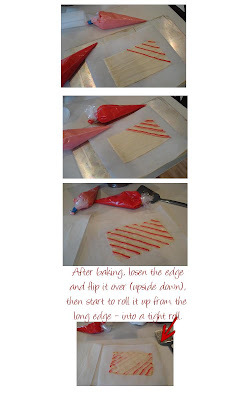 Use the pink and red colored dough to pipe stripes on your cookie. Bake 6-8 minutes until the edges are pale golden brown. Immediately loosen the edge of the cookie with a spatula and flip it over. Starting from one of the long sides, roll the cookie up into a cylinder shape - or a cookie stick or 'roll'. Let cool completely. (click on the photo below to make it larger and read the instructions as well as see the details). These cookies set up fast after they come out of the oven so you must work quickly. I found it best to have three cookie sheets going at one time, as I would take one out of the oven I would have another cookie ready to go in, and one half way done cooking. This way I was removing a cookie and rolling it approximately every 3 minutes.